1) A kikkoman recipe book. Why the truck, I have no idea. 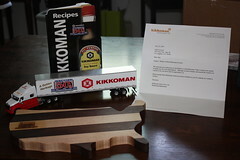 It was a very sweet gesture, but seriously, and this is a message to all the contest runners out there – I would have been far happier with some free kikkoman. Yes, even after buying a giant drum of it, I am now out, and want free soy sauce. The recipe book is nice, though. The truck got given away to a neighborhood child. I hope he has more soy-sauce related fun than anyone else on the block. You should have gotten a gift cert for free Kikkoman in the recipe book. Take another look, I got the same package a couple of days ago. Thanks for the heads up – but just checked and nothing there.